The Gee Gees Fruit Machine Review - Casino Answers! 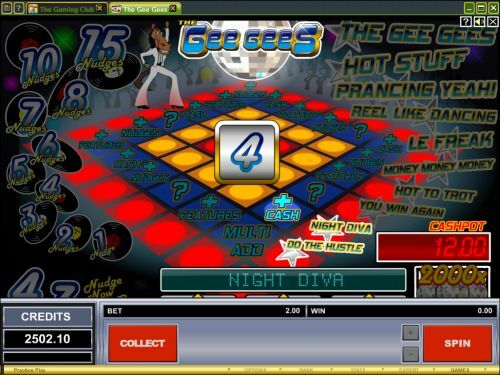 The Gee Gees is a 3-reel, 1-line AWP fruit machine developed by Microgaming, featuring a hold feature, nudge features, a bonus game and more fruit machine features. You can play the Gee Gees fruit machine at Bovada. Bets on the Gee Gees slot machine are $0.10, $0.20, $0.25, $0.50, $1, $2 and $5 per spin. The Gee Gees has a low betting range best suited for casual players. 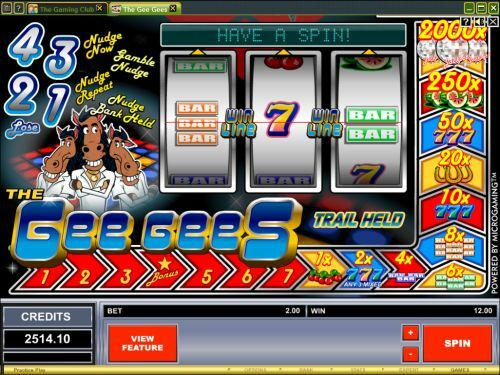 To play the Gee Gees fruit machine, select your bet with the “-” and “+” buttons and press “Spin” to spin the reels. The top paying symbol on the Gee Gees fruit machine is the Disco Ball symbol. If you land 3 of these symbols on the payline, you will win the 2000 coin top jackpot. The second highest paying symbol is the Watermelon symbol, which can pay 250 coins. A randomly triggered special feature during the regular slot game on The Gee Gees is the hold feature. The hold buttons will show up in the game buttons. You can press each “Hold” button underneath each reel to hold that reel for the next spin. You can reset the hold feature by pressing the “Cancel” button. Another random feature on the The Gee Gees AWP slot game is the nudge feature. By using the nudge feature, you can press the “Nudge” buttons below the reels to create new winning combinations. You can be awarded up to 4 nudges per spin. Use the arrows above the reels for a preview of the symbols on the reels. The nudges can also be held, gambled and repeated, which are also random features. The third random feature is the Trot On feature. This special feature will spin the reels into an automatic winning combination. The Gee Gees features a trail that consists of 7 spaces. During play, if you land on symbols with numbers on them, you will move up that number of spaces on the trail. The trail will be reset after each spin unless the Trail Held feature is activated. After 7, the trail will continue into the payout schedule, so you can even win cash by moving up the trail. There are 10 winning combinations on the Gee Gees fruit machine. The complete regular game payout schedule is as follows (payouts in parenthesis): 3 Cherry symbols (1), any 3 Seven symbols (2), 3 Single Bar symbols (4), 3 Double Bar symbols (6), 3 Triple Bar symbols (8), 3 Blue Seven symbols (10), 3 Horseshoe symbols (20), 3 Yellow Seven symbols (50), 3 Watermelon symbols (250) and 3 Disco Ball symbols (2000). The Gee Gees offers most of what the common fruit machine player wants – a comical theme, lots of special features and chances to win plenty of cash. It’s all here on the Gee Gees fruit machine. You can play the Gee Gees fruit machine when you sign up and make a deposit at Bovada! Are USA players able to play The Gee Gees pub slot for real money? No, American players cannot play the Gee Gees online slot for real money at this time. Instead, you can play the many USA-friendly slot games over at Bovada. Where can I find a flash game of The Gee Gees? A flash game of The Gee Gees can be found at Bovada. You can play for free or real money. If you have any problems with the flash casino, make sure you have installed the latest version of Adobe Flash Player.